This beautiful image is a timeless classic. 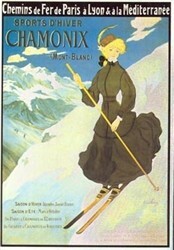 The woman in this poster, wearing her stylish dress and sporting her single ski pole, shows the style of the day. 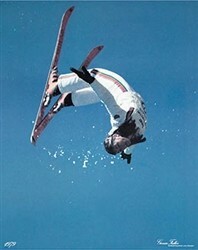 This was before Bogner, Obermeyer, and White Stag set the trends for ski clothing. 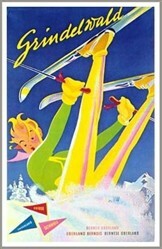 In this era, folks skied in the clothing they wore around town, since there was no notion of having separate clothes for skiing. 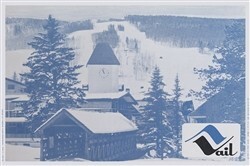 Thus the normal skiing and winter clothing worn by women would have been these types of really large dresses, with wool layers underneath. Remember that there were no lifts, so the women also hiked up the mountain wearing this amount of clothing. Quality reproduction of original.